Our mentors are friendly, experienced Haskell developers who will help teach you new techniques and tricks. "Beam " <> who <> " up, Scotty!" 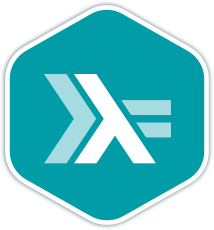 Haskell is a general-purpose programming language known for being purely functional, non-strict with strong static typing and for having type inference. Purely functional means that you don't update variables or modify state. Pure functions will always return the same value given the same input and will do nothing else. Functions that are referentially transparent are more predictable and more composable. Non-strict (somewhat like lazy) means that you can express infinite data structures. Strong static typing means that a lot of program errors are caught during compilation. Type inference means that the compiler can often figure out the type of a value by itself. The compiler can also tell you if a value has conflicting types in different parts of the code. There are more than 10,000 free third-party packages available at Hackage, the Haskell community's central package archive, and you can download them using the Stack tool that Exercism also uses. You can also read the free book Learn You a Haskell for Great Good or follow the interactive tutorial at tryhaskell.org. To me, the standout track has been the Haskell track. With only a very limited grasp of functional programming, the frequent and insightful comments I received were invaluable in getting to know the language. Once you join the Haskell language track, you will receive support and feedback from our team of mentors. Here are the bios of a few of the mentors of this track. I love functional programming, especially the deep theoretical background that comes with Haskell as well as the readability and safety it provides. Haskell is a mind expanding language and I love the way it changes how you think about programming. I'm still fairly new to Haskell, but was a seasoned Schemer in the past, and use FP techniques whenever they are appropriate. Professionaly I do embedded programming in a mixture of C and Rust code. Coding in Clojure and 10+ years Java before. I couldn't apply Haskell directly at work so far, but feel how it influenced my way of programming in other languages as well. I like Haskell very much. Although I'm not that good at it, I hope everyone will fall in love with her. I will do my best to help everyone. Besides, I come from China, so if you use Chinese, I can also understand it. These are a few of the 94 exercises on the Haskell track. You can see all the exercises here. The Haskell Maintainers are the brains behind the Haskell Track. They spend their spare time creating interesting and challenging exercises that we can all learn from. We are incredibly grateful for their hard work. Here are the bios of a few of the maintainers of this track. I taught myself Haskell as a logical next step after having learned OCaml. Although I don't use it for my job, I find it an interesting language; I especially enjoy its type system. I'm mostly a "break glass in case of emergency" maintainer. Get started with the Haskell track. As with everything on Exercism, it's 100% free!